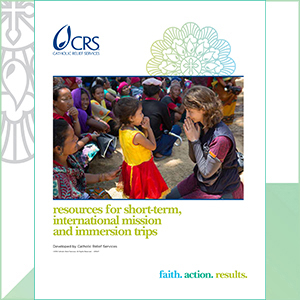 CRS has developed resources for short-term, international immersion and mission trips. Rooted in Catholic teaching and based on our extensive experience working with partners overseas, these resources are designed to be used by a facilitator with groups as they prepare for, take and return from trips. Please note: CRS is not able to sponsor trips overseas. Includes handouts and reflections referenced in the facilitator’s guide. It’s designed to accompany participants before, during and after the trip. Please also see a service learning retreat from the United States Conference of Catholic Bishops (USCCB) and CRS that provides training to those leading service immersion experiences.